Dealing with an unforeseen Central AC repair doesn’t have to be a problem. 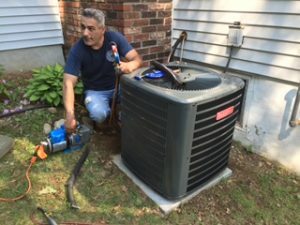 Chelsea Cooling and Heating Services is here 24/7/365 to help get your central air conditioner back up and working and your life back to normal. Regardless of the problem you’re having with your central air conditioning system, our skilled experts have dealt with it previously. It’s also important to mention that all of our central air conditioner repair and service calls are 100% guaranteed, offering you peace of mind that you’ll be cozy long after your issue is resolved. Feel free to give us a call at 646-844-5455 to schedule your Central AC repair service right now. If you think you hear a clicking noise coming from your central AC unit, call us right away. If your Central AC isn’t running, you can check for a blown fuse or a flipped breaker. Check your electric box and swap the fuse or flip the breaker. If the the central air conditioning still won’t come on, give us a call so we can help determine the source of the problem. Find out more about our repair process on here. Need one of our experts in Chelsea for an central ac repair service ASAP? Call 646-844-5455 to get it scheduled, and we’ll get your central air conditioning working beautifully before you know it.